There is little to be said about her life. Born at Camigliano in Tuscany, she suffered from 'tuberculosis of the spine with aggravated curvature', and, though she considered herself cured by a vision of the young Saint Gabriel Possenti, she could not obtain a certificate of health enabling her to enter a convent, as she wished. 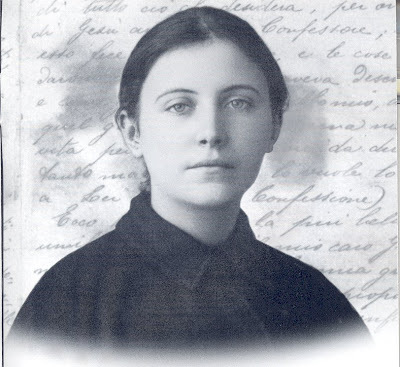 She had many 'abnormal' experiences from June 1899 onwards, including the 'stigmata' in hands and feet, carefully examined by her confessor and biographer, the Passionist Fr Germano. These began to appear about 8 p.m. on a Thursday and lasted till 3 p.m. on the Friday. No pain preceded their apparition, but only a deep recollection. There was seen first a discoloration on the back and palm of each hand; then a 'rent in the flesh' under the skin which then split, and a deep laceration was observed, at least usually: the holes above and below corresponded and the perforations seemed complete, but it was hard to judge of this because they kept firing up with blood, partly flowing, partly congealing. Fr Germano measured the diameters and shapes of the wounds carefully, and noted that 'a few times' a sort of fleshy swelling, like a nail-head, about an inch across, covered the wounds in the hands (though not those in the feet): 'The deep wounds were the more usual state of Gemma's stigmata—I say, the more usual state'. He also says that directly the Friday ecstasy was over, 'the flow of blood from all < five> wounds ceased immediately; the raw flesh healed; the lacerated tissues healed too': at least by Sunday not a vestige remained of the deep 'cavities'; the new skin was smooth, though 'whitish marks' remained on it. Much more could be said about this saint, but this account suffices as occasion for explaining the principles governing the Church's approach to these and allied phenomena.